Gimme Shelter | Stoat – Where? I know, I can hear it. No, it’s raining on me, indoors, now! We didn’t expect much from an $7 island bungalow, but a roof over our head was, I thought, implied. It’s pretty much the definition of shelter after all. Despite a 7 month itinerary, we still don’t have enough time to cover everything we’d like to see, and so after a fantastic 6 weeks or so, we find ourselves with only 11 days to see Cambodia. We already know we will need to return. 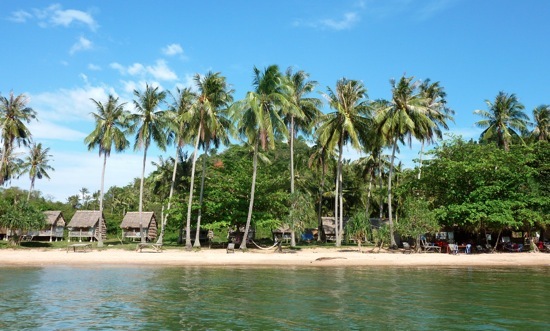 Given the dilemma of visiting Sihanoukville or Kep (and what a nice life it is, if this can be considered a dilemma), we opted for the second, deciding also to take two days and one night on Rabbit Island, a pleasant 25 minute boat ride over mercifully smooth waters off Kep’s coast. 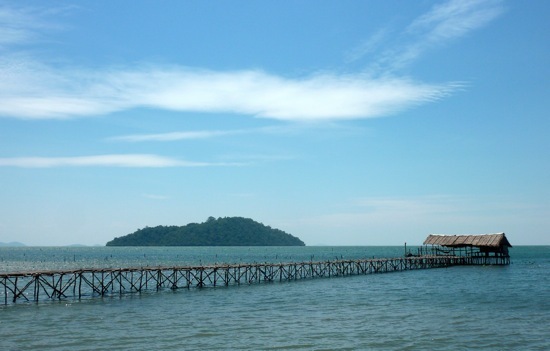 There aren’t any rabbits on Rabbit Island, known locally as Koh Tunsay, and it is rabbit-shaped in the same way that Great Britain is shaped like a cat. Rabbit isn’t on any of the menus and there is no secret rabbit breeding program underway there that I could see – not that a rabbit breeding program could remain secret for very long. Despite that flagrantly false advertising, and the occasionally porous lodgings, of all the places we’ve visited it is one of my favourites. The evening storm blew away all the clouds of the first day, leaving the sky clear and bright. After breakfast, a complete circuit of the island only took about an hour and a half on foot, leaving us time in the same day for lunch, a swim, reading and a Khmer massage with coconut oil. As promised, the crab I ordered for lunch was dutifully collected from baskets in the water, brought back up past our table still snapping, grilled immediately and then served with a light lemongrass and pepper sauce. We didn’t exactly swim – 100m off the sand, the water was still only up to my waistline – but we splashed around enough for it to count. Khmer massages are thankfully less strenuous than Laos ones, though next time I must remember to wear underwear to avoid baring all on the beach while changing into the looser clothes they provide. Total cost per person, including accommodation: $16. 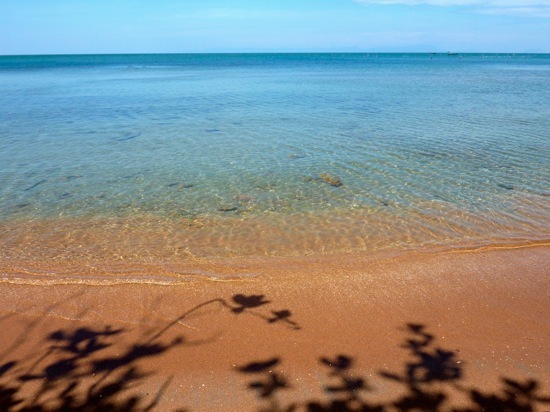 We were met on our return to the mainland by Vet, a friendly tuk-tuk driver, who then joined us for beers on Kep’s small beach and then on for dinner at a seafood restaurant. Apart from a brief, harrowing description of the Khmer Rouge and their brutal regime, he was happy and jocular, teaching us a few Khmer words and telling us of his hopes for his children. 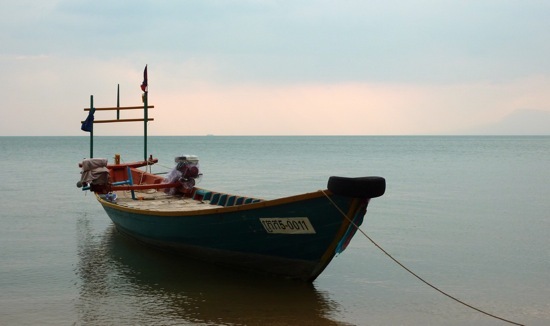 He anticipates large changes in Kep in the next few years as over-fishing and tourism takes its toll on the local economy. As with Phu Quoc, if you look, you can see signs of impending development and while it would be churlish to deny the local people a chance at improving their lives through an influx of money to the region, part of me hopes they can retain at least some of the local charm and character that makes this idyllic part of Cambodia so appealing.